This Forex trading system utilizes two classic indicators: All RSI and Stochastic cross alert sig overlay ; I use the two indicators on two different time frames. 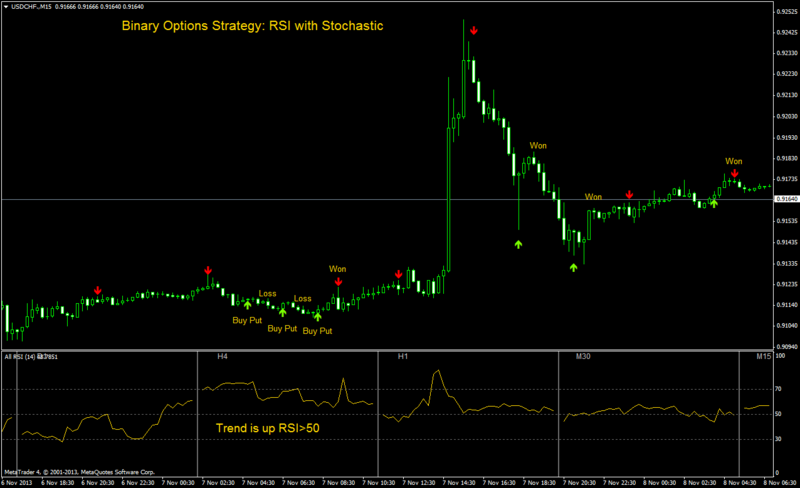 The All RSI Indicator ( 14 period ) see the 4H chart (in the subwindow on the sreen) , while the Stochastic cross alert sig overlay (settings 5, 3, 3) is used on a 15 minute chart (the opening chart). The idea is RSI on the 4H chart will show the direction of the price while the Stochastic will give us the actual trade signal. 2. Arrow of buy of the Stochastic cross alert sig overlay on the 15 minute chart basic on the screen. 3. Enter a Buy call at the opening of the next candle. ( For an best entry, wait that the price retraces 3 pips below price opening candle). 2. Arrow of sell of the Stochastic cross alert sig overlay on the 15 minute chart basic on the screen. 3. Enter a Buy put at the opening of the next candle. ( For an best entry, wait that the price retraces 3 pips above price opening candle). For other Trading plataform open 2 charts : 1° 15 min with stochastic indicator (5,3,3) and 2° 4H chart with RSI (14 period). Stochastic oscillator (5,3,3) on the 15 minute chart crosses upwards, from Oversold territory and buy put when crosses > 20 level. Relative Strength Index on 4H time frame is below the 50 level. Stochastic oscillator (5,3,3) on the 15 minute chart crosses downward, from Overbought territory and buy put when crosses < 80 level. This is only a trading idea, but this idea needs to be improved. I think you meant to have "all rsi" in archive file but instead it has "all macd". 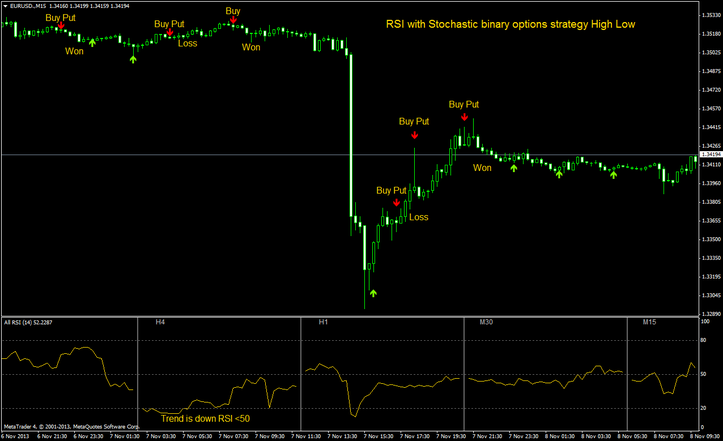 Binary Options Strategy: RSI with Stochastic Template and indicator.